COLUMBUS, Ohio -- Ohio is ready to deliver its formal comeback to another state's claim that a rival aviator beat the Wright brothers as first in flight, defending what one witness described Wednesday as "a marketing brand of enormous value." A resolution repudiating Connecticut's claim cleared its final committee hurdle Wednesday. Senate passage was expected and its sponsor said the third state in the Wright fight - North Carolina - was supportive. 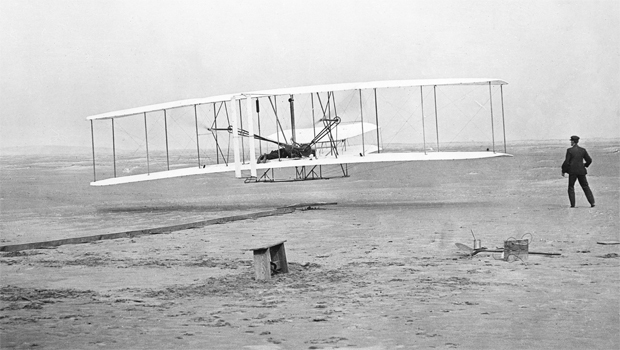 The Wrights were born in Ohio and took their first flight off Kitty Hawk, North Carolina, in 1903. "I heard Connecticut was also laying claim to Sasqatch and the Loch Ness monster," Ohio state Sen. Bill Coley quipped as the resolution cleared his committee. The Ohio resolution's sponsor suggests Connecticut is changing history without evidence and Ohio must respond. Backers argue aviation historians have examined and dismissed accounts that Whitehead flew a powered, heavier-than-air machine of his own design on Aug. 14, 1901 "or on any other date." Connecticut Sen. Kevin Kelly wonders why Ohio's leaders "aren't even intrigued." The dispute over the historical aviators has escalated in recent years, launching documentation fights among aviation experts, defenses of the Wrights citing the scholarship of major institutions such as the National Air & Space Museum and publication this summer of a 432-page book laying out the case for Whitehead's claim. "We are an educated people who deserve to know the truth, to know what actually happened, rather than a glorified fairy tale," author Susan Brinchman wrote in releasing the book. Amanda Wright Lane, the great-grand-niece of the Wright brothers, made a repeat trip to the Ohio Statehouse Wednesday to support her relatives' legacy. She told an Ohio Senate committee ahead of the first flight resolution's unanimous approval that their 12-second flight "changed our nation and our world and, frankly, our relationship with the universe forever." She said their flight is represented in the "iconic photo" of the Wright flyer, "journals of data, letters, testimony, patent applications, more photos and published research." Connecticut Sen. Kevin Kelly has continued to defend his state's law. He has said as the Ohio resolution progresses that he believes lawmakers in both states "owe history the courtesy" of determining who was first.